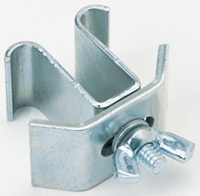 Patented Corner lock release allows shelf adjustment in seconds...without tools! *Microban® antimicrobial product protection built into the shelf mats to inhibit stain and odor causing bacterial growth. Mats remove for easy cleaning. 15 year warranty against rust and corrosion. 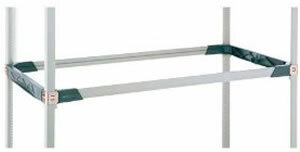 posts for wet environments. Lifetime warranty against corrosion on mats, 15-year warranty on shelf frames and posts. making installation, cleanup and disposal easy. the posts, and reposition the shelf. adding any standard MetroMax stem caster. 600 lbs. 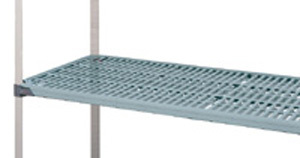 (275kg) per shelf up to 72" (1825mm). For additional shelves and accessories see bottom of page. 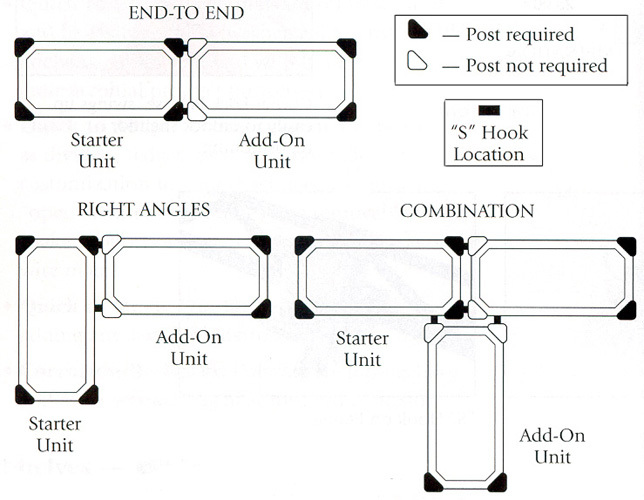 Starter Units - consist of four posts and indicated number of shelves. Complete with frame, mat, and wedge connectors. compensate for uneven surfaces. Epoxy coated. plug. Two kits required per storage level.  Use to create organized compartments or to simply separate shelf contents. 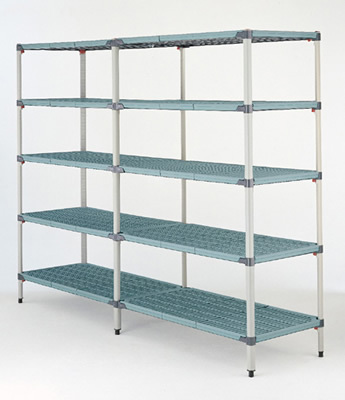  Easily repositioned on grid and solid shelves.  Corrosion proof: Polymer (High-Density Polypropylene).  Three-piece design  Ships assembled. Model No. Length Appox. Pkd. Wt. 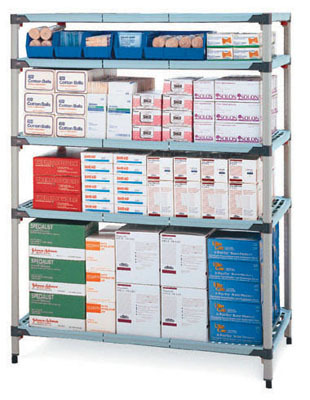  Maximum fl exibility: Can be repositioned along the entire shelf.  Easiest divider to install. then drops into place. Does not attach to solid shelves. frame and a bag of wedges. 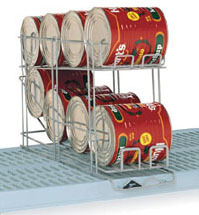  Wire Baskets: A convenient way to store and transport small items in bulk. level frame. 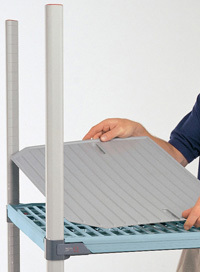 Handles allow for easy removal and transport. Finished with tough corrosion resistant gray epoxy.  Overlays snap onto the open grid mats to create a solid surface.  Available for 21" deep MetroMax Q shelves. 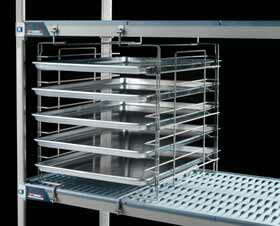  Slot Opening: 3" W x 3 7/8" H.
 Designed to work with MetroMax i® and MetroMax Q® shelves. Mounting clips included.  Post Clamp: Adds stability by joining posts of two separate units together. 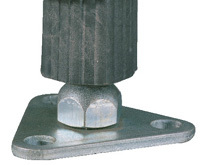 bolts, when a broader foot is desired. Approx. Pkd. Wt. or twelve #5 cans. Tough, corrosion-resistant gray epoxy finish. 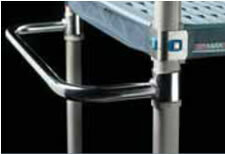  Use handles on mobile units to improve maneuverability and ergonomics. 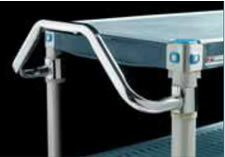  Handles are compatible with MetroMax i® and MetroMax Q® units. of an add-on unit with two posts. storage and transport unit to meet your needs.  Polymer Casters: Corrosion-resistant design. number (e.g. 5PC-TG, 5PCB-TG, 5PCR-TG). Note 2: Stem caster are shipped with donut bumper at no extra charge. 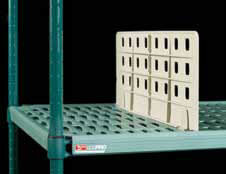 Protection, Shelves Adjust at 1" Increments, and Polymer Shelf Mats from your source for material handling equipment.